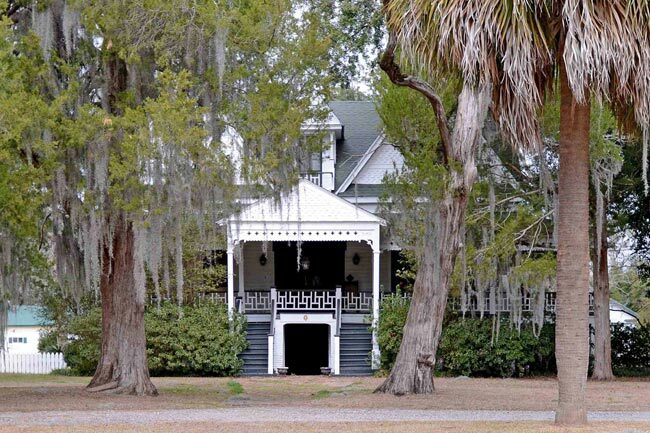 This home in the Allendale County community of Appleton likely was built around 1853, though the early history of the house is unknown. C.H. Colding owned around 900 acres in this area – then part of Barnwell County – in 1850 and with the use of enslaved labor, grew corn, sweet potatoes, and cotton. He bought an additional 430 acres of land in 1853 that had been part of the White Lands tract, including the parcel where this house sits. In 1855 Colding released to William Flowers in trust for his wife, Elizabeth, “all that tract or parcel of land whereon I now reside containing four hundred and thirty acres,” implying that the house was extant at that time. Following Colding’s death in 1883, the 430 acres were divided among his family members as well as others who had an interest in the estate. Colding’s son, C.H. Colding, Jr., conveyed his interest of the property, which included 10 acres and the “homestead,” to Richard Henry Walker. Walker was instrumental in developing the village of Appleton, a railroad town established in 1872 and named for a railroad official. 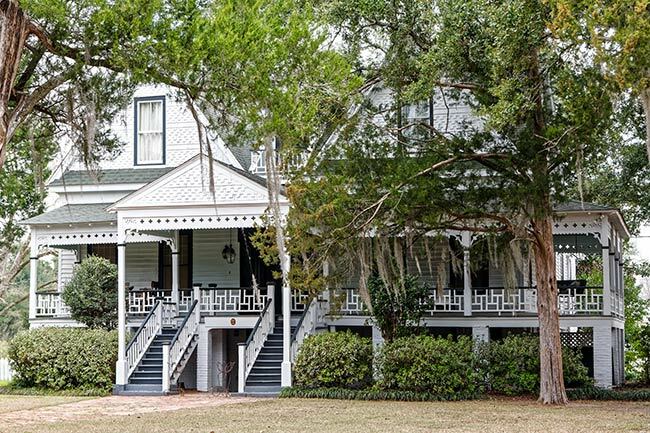 A businessman and state representative who served in the South Carolina House of Representatives from 1903 through 1904, Walker was responsible for adding the Victorian embellishments to this previously simple farm dwelling. In the late 1890s Walker renovated the house, adding the wrap-around porch and ornamental details associated with architecture of that era. Over the course of Walker’s ownership, he acquired 2,500 acres of land in the Appleton area. 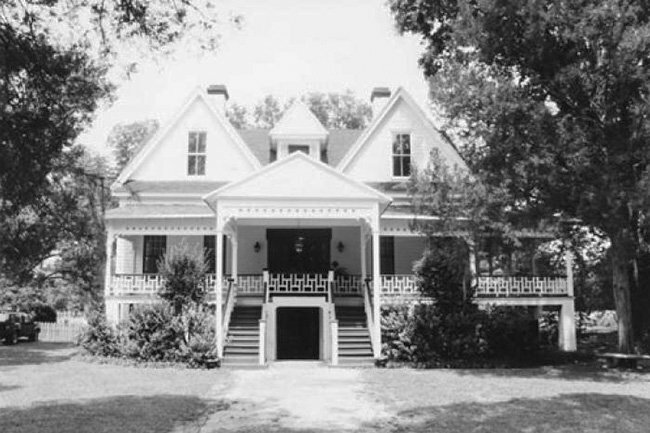 The home remained in the Walker family until 1936 when it was purchased, along with 192 acres of the Walker tract, by Woodward Allen. He and his wife called their home Robwood for their two children, Roberta and Woodward, Jr. The home was purchased from the Allen family by Collum’s Lumber Mill in 1995 before being transferred to another family as a residence in 1997. (Robwood) The Colding-Walker House, ca. 1853, is a one and one-half story residence set upon a raised brick basement. The historic core of the building, which dates to the mid-nineteenth century, consists of a typical side gabled massed plan arrangement with a central hallway. Today the appearance of the building is largely defined by Victorian detailing introduced during an extensive renovation conducted in the late 1890s. A full-width wrap-around porch embellished with Victorian spindlework detailing dominates the main façade. A gable front portico supported by thin chamfered posts shelters a double stairway that leads to the main entrance. Two large gabled dormers and a central gabled walkout extend from the roof at the front and rear of the building. The exterior of the residence is clad with weatherboard while the gable ends and dormers are covered with shingles laid in a staggered formation. This house represents the evolution of a typical lowcountry planter’s dwelling from a simple one-story, lateral gable house to a stately residence embellished with Victorian detailing. The building retains much of its historic fabric and is a fine example of Folk Victorian style architecture. Several frame outbuildings are also located on the property including a carriage house, smoke house and barn. I am interested in finding any information regarding Dr. C. H. Colding. I know that he must be a distant relative, trying to connect the dots. Thank you!